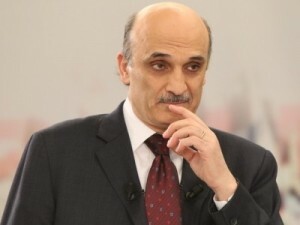 Lebanese Forces leader Samir Geagea accused Hezbollah of arming and training activities in Tripoli. Commenting on the rumors concerning the presence of Al-Qaeda cells in Lebanon, the Lebanese Forces leader lashed out at the government of Prime Minister Najib Mikati and pointed the finger at Defense Minister Fayez Ghosn. “If [Al-Qaeda] really exists [in Lebanon], then why doesn’t Ghosn take a decision to arrest its members,” Geagea added. He also said that the government should act in full responsibility regarding the crisis in the North. Mawlawi’s controversial arrest Saturday sparked clashes in Tripoli, north Lebanon, between opponents and supporters of Syrian President Bashar Assad, leaving at least 12 dead and over 100 wounded. What outraged Mawlawi’s supporters was the way he was tricked to be arrested… General Security personnel dressed in civilian clothes lured him to a social services center belonging to Finance Minister Mohammad Safadi with promises of medical care to his sister , only to arrest him. Since when do security services have to justify how the supposedly trick someone into arresting them? Didn’t the USA recently admit they had an undercover operative that helped catch the latest underwear bomber? He was actually helping him to plan the event when they arrested him? Security services are dames if they do and dames if they don’t…. If alqaeda docent exist exist then someone please explain naher elbowed? This is happening all over again….I think gagea is playing a dangerous game and should distance himself from this the same way gmayell has….in regards to hzb I see no benefit in them training anyone if who there…love to know where he gets his intel from?? i agree with you 100 % about the way to arrest people wanted for criminal activities no matter who it is..but in this case i think this guy was arrested without a warrant..normaly a judge has to look at the evidence and decide if he or she should issue an arrest warrant. as i understood the events in this case is that he was arrested then 2 or 3 days later the arrest warrant came through.. The Ninja are on Tripoli streets … almost no-one else … no cars … and army and ISF seem gone. One way to have peace, perhaps … threaten everyone.